Business Plan Oasis | Your Business. Your Plan. Your Way. 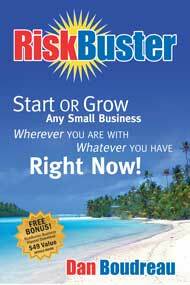 At the RiskBuster Business Plan Oasis you’ll find free worksheets, The Shell™ a business plan template, the Biz4Caster, a financial forecasting spreadsheet tool, and video resources. One of our most popular tools at RiskBuster is the Business Planner’s Online RoadMap. This is a virtual step-by-step guide to writing a business plan, that will take you from business idea to opening day. Please click on the tabs and explore the business planning resources. While you are going through the material, review it from the eyes of how you might use it to get closer to owning your very own business.